As California housing prices rise and wages remain stagnant, the need for affordable housing has never been greater. That’s why the 2015 California Economic Summit held in Ontario this week included affordable housing in its “One Million Challenges” initiative to build one million middle- and low-income housing units in the next decade. Work with local officials and state lawmakers to highlight the negative consequences of not building affordable housing. Work at the regional and local level to encourage more housing in the right locations. This is a way to increase density and encourage more housing development, including inclusionary zoning and strategies which will encourage local governments to plan for higher density in their Housing Element. “Eight-three percent of homes in the state are unaffordable on the average teacher’s salary, said David Smith, partner at Stice & Block LLD, sharing with Summit attendees stark news about the state of housing in California. 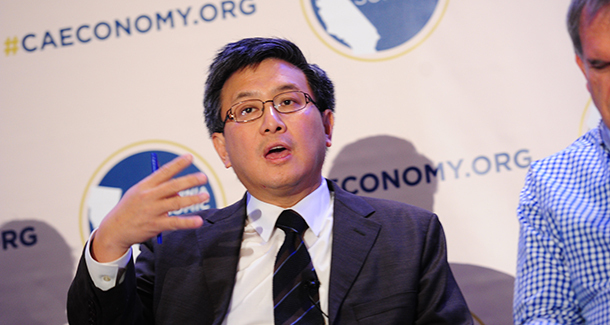 California State Treasurer John Chiang added the state is losing many young people because they can’t afford to live here. Chiang also pledged to create greater access to affordable housing by working with the state legislature. “It takes a village to create affordable housing, from the federal, state and local level,” said Chiang. Regulatory reforms is one area that needs major according to Caleb Roope of developer The Pacific Companies. “Affordable housing regulations increases the cost of building units," said Roope, who also suggested that affordable housing should become a top priority in coming elections. Randall Lewis of Lewis Homes brought a list of quick recommendations which included studying the market needs, educating electing officials about the importance of affordable housing, fighting for appropriate density and tying the importance of housing to public health. Summit participants will now return to their communities to work on the priorities with the stakeholders in their communities, which include local elected officials, homebuilders/developers and non-profits who service the affected communities. Co-presented by California Forward and the California Stewardship Network, the Summit brought together more than 400 civic and business leaders from across the state to discuss how to move California along the path to shared prosperity.